For millennia, evil warlords, wizards, dragons and larger goblinoids have enslaved the lowly goblin. Untold thousands are slain every year by these same dark masters, by the armies of good folk everywhere and by countless brave adventurers. 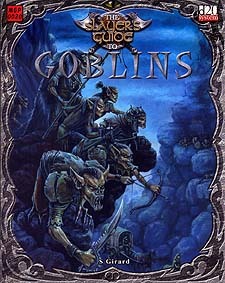 Through seemingly endless adversity, the goblins overcome and continue to thrive. Throughout history, creatures of all types have underestimated the races cunning and sheer will to survive. Often they have paid for this misconception with their lives. Deep in the warren of a goblin tribe there is no room for error. This harsh and unforgiving environment shapes the goblin and thwarts the invader. Full of a hatred for all life, driven by their dark god to unspeakable depravity and far more cunning than Game Masters and players have given them credit for, goblins are truly worthy of our respect. They breed faster than most races and, given time, can outlast and overwhelm most enemies. Masters of stealth, traps and ambushes, goblins are rarely spotted until it is too late. For Games Masters and Players Alike.